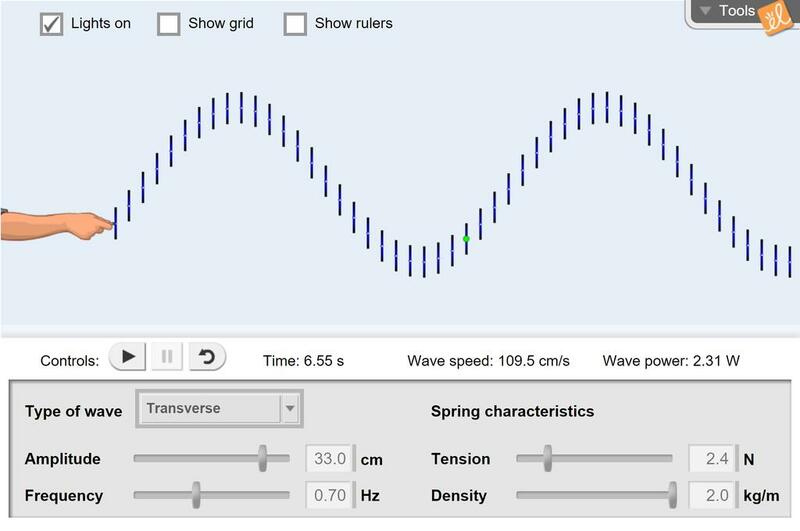 Observe and measure transverse, longitudinal, and combined waves on a model of a spring moved by a hand. Adjust the amplitude and frequency of the hand, and the tension and density of the spring. The speed and power of the waves is reported, and the wavelength and amplitude can be measured. This sheet contains the key vocabulary words in order of appearance in the lesson. Students create an ill... (more)ustration of the word then provide a definition in their own words as they work through the Gizmo. Great simulation for students to determine traveled (not displacement) for an identified point between times t=0 and t=T.(period). Great way to introduce and let students explore with waves. Perfect for instruction on waves. Nice intro to measuring wave properties.